Why Does Rosacea Make My Face So Red? Are you embarrassed of always looking embarrassed because of the redness in your face? Tired of everyone asking you “what’s wrong?” all of the time? If so, you may be one of the 16 million Americans suffering with a condition called Rosacea (roh-Zay-sha). At Celibre Medical Corporation, we get it and are here to help you through treatment of this frustrating condition. There are many medical treatments out there for Rosacea, and while they may work great for some people, maybe you’ve tried all the creams or even some of the oral medications and they just haven’t helped. 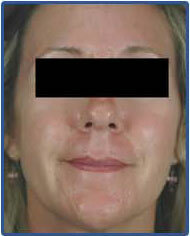 Laser treatment for Rosacea can really make a difference for you! 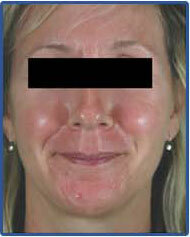 Celibre Medical Corporation offers Class IV medical laser treatments for Rosacea. These are super effective at reducing the redness that you have because they target the microscopic blood vessels in the skin, which are really the root cause of the redness. Let us be real with you though for a moment: lasers are not a cure for Rosacea. It’s important that you understand that fact. While they can reduce and improve the outward signs of it, no one has yet discovered a lasting cure for this difficult problem. What is Rosacea and What Causes It? Rosacea is a very frustrating, yet common skin condition that causes facial redness, burning, itching, dryness and/or pimples off and on in those who have it. If left completely untreated, long-term, permanent changes of skin texture that can alter the appearance of the nose (rhinophyma) may occur. All of these changes in the skin occur due to an inflammatory process that triggers the skin’s blood vessels to dilate. While no one is totally sure what causes it, there are lots of guesses. Here is what we do know about Rosacea: it typically runs in families and is diagnosed after the age of 30; it commonly affects those with fair skin who blush easily (Northern European heritage), but can affect anyone with any skin type, and it is a triggered process. This means there are one or more internal or external things that often trigger a flare up, or a dilation of those blood vessels that lead to the uncomfortable and embarrassing redness and discomfort. What makes Rosacea so tricky to control is that every individual may have his or her own unique set of triggers. Celibre Medical is dedicated to the awareness and education of those who suffer with Rosacea. We understand the process and while we love treating Rosacea patients with our medical grade lasers, we also want you to understand that you too can play a role in controlling the appearance of your skin. We can help educate you on what common triggers are. Things like sun exposure, spicy foods, alcohol, caffeine, certain harsh or abrasive skin care products, heavy exercise and tobacco may all be making your Rosacea worse. It’s our priority to take care of you; and we wouldn’t be doing our jobs if we only recommended laser Rosacea treatment. We are here to help you understand your condition, and we will be your partners in treating it. By identifying and avoiding triggers, we can help you have better control over your Rosacea and reduce its control over your life! If you haven’t heard of the National Rosacea Society, please check out their website. It is absolutely the best resource out there for anyone suffering with Rosacea. In a 2014 survey they conducted, they found that almost 78% of Americans don’t have any knowledge of Rosacea. So what is everyone thinking of the 16 million Rosacea sufferers that they see walking around everyday? Maybe that they drink too much? Or maybe they think that they don’t eat right or take good care of themselves? The psychological impact of Rosacea can be really devastating to the person who has it! That same study found that 70% of Rosacea patients said that it had lowered their self-confidence and self-esteem, and 41% said that Rosacea had caused them to avoid public contact or cancel social engagements. In those with severe Rosacea, nearly 70% said that it had adversely affected their professional interactions and close to 30% said that they’d missed work due to their condition. Our practice understands the devastating impact that Rosacea can have on your life. You’re not alone and we can offer you help to get back to feeling good about your face again. Laser treatments can really help your skin look and feel its best, and while they are not a cure, they are extremely effective at managing the signs and symptoms of Rosacea. Please give us a call today and schedule your absolutely free consultation at either of our conveniently located offices in Los Angeles or Orange County. What are you waiting for? Let Celibre Medical Corporation help you manage your Rosacea today! Contact us today to schedule a FREE Rosacea Treatment consultation!